Eylure Pro-Lash Dylash Dark Brown £9.49 Prior to my holiday I toyed with the idea of getting my brows HD’d. But I was feeling a little reluctant to splash out £30 on my eyebrows (I’ve had this treatment before). So instead I opted for a quick brow thread at the expense of £6.00 and then picked up the Eylure Pro-Lash Dylash for £9.49 at my local Boots. And I couldn’t of been happier with the results. It was easy to apply, long lasting and not once did I fill my brows in whilst away. I wish I had tried it sooner! Avène Thermal Water Spray £3.15-£10.00 Unfortunately whilst on holiday I got plagued by prickly heat. Prickly heat is an itchy rash of small, raised red spots and let me tell you, it wasn’t nice! It's common in hot, humid conditions and my body clearly wasn’t prepared for the 35C heat. 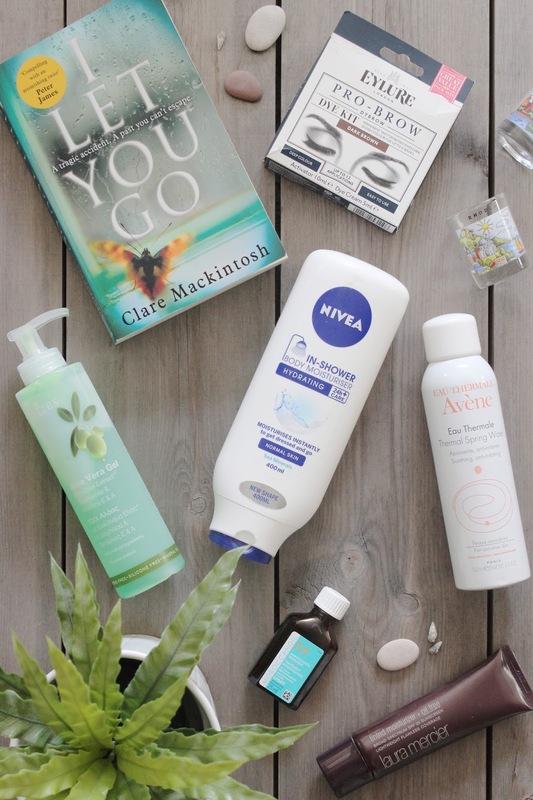 I didn’t let it spoil my holiday and along with spending time in the shade and dipping into the sea, two products really helped me to keep cool, the first being the Avène Thermal Water Spray, I would spray it all over my chest and thighs and my skin would instantly feel calmer. And I also purchased pure Aloe Vera Gel from the local store, which help to relieve the stinging sensation. 'I Let You Go' By Clare Mackintosh £3.85 ‘I Let You Go’ fast became my favourite book after I devoured it within 24 hours. It’s the best psychological thriller I have ever read, even over the likes of ‘Gone Girl’. It’s a compelling read, fast paced, emotional, with remarkable unforeseen twists. Recommend. Moroccan Oil Treatment Light 25ml £13.45 This light treatment is hands down the best hair product, I have ever had the pleasure of using. Whilst I was away I ran a small amount of the silky oil through my damp hair on a daily basis, helping to detangle after dips in the sea and it’s signature ingredient Argan oil, protected my hair from damaging UV rays. Without a doubt a must have to add to your holiday beauty packing checklist. You can read my full review here. Laura Mercier Oil-Free Tinted Moisturiser SPF20 £34.00 I may be on repeat having only mentioned this product last week in my June Beauty Favourites, but this tinted moisturiser from Laura Mercier deserves all the praise. Whilst I was away I wore little to no makeup during the day. And if I did, I would only wear one product, the Laura Mercier Oil-Free Tinted Moisturiser. This tinted moisturiser gives a beautiful glow, whilst evening out my skin tone, with neither shine nor grease and its added SPF of 20 was a bonus protecting my skin whilst I sat in the sun. I also found the shade ‘Bisque' was very forgiving, as my tan got deeper. You can read my full review here. Nivea In Shower Body Moisturiser Normal £3.00 I didn’t even bother to pack a body moisturiser (who wants to be a sticky mess in 34C heat?). The Nivea In Shower Moisturiser was all I needed. I would simply wash and slather my body in the stuff and then rinse it away. It does leave behind a residue, but it’s non-sticky and smells rather lovely. It kept my skin hydrated and helped to prolong my tan.